After sleeping for two days straight out of pure exhaustion, today was my first Thanksgiving since I was diagnosed with Gastroparesis in March. I've been up the past two nights all night, vomiting. I finally got to the point where I laid down on my pillow on the bathroom floor by the toilet. My husband is one amazing person and I love him so much. He stayed home with me on our 8th wedding anniversary because I was too sick to go anywhere and he brought me flowers. I made an event for Gastroparesis Awareness today to get the word out about my disease and a lot of my friends wore green today to support those of us who cannot eat. I thought it was incredibly nice of them, especially since many of them were traveling. 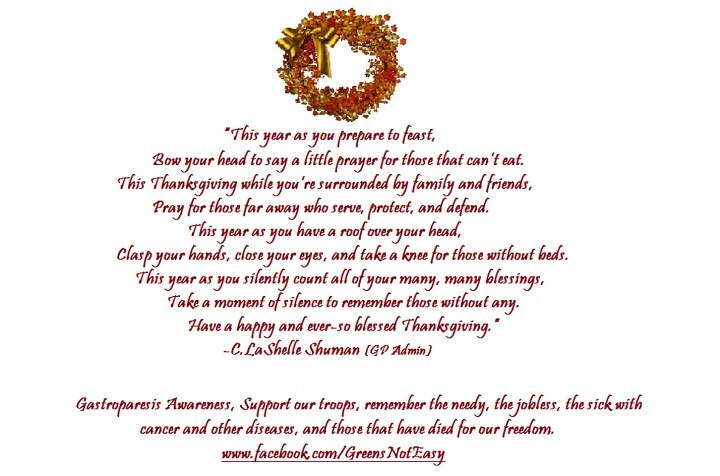 This Thanksgiving, please say a prayer or keep the people who are unable to eat in your thoughts. My friends are wearing green today to support those who cannot eat. Gastroparesis is a debilitating stomach disease that literally means paralysis of the stomach. One of every 62 people in the united states alone (about 5 Million Americans) have been diagnosed with Gastroparesis. Most people take for granted being able to wake up every day and sit down to a good meal. Those with Gastroparesis just can't. Why? Because when your stomach stops working, you lose your ability to eat. Symptoms of Gastroparesis include non-stop nausea, Vomiting, severe abdominal pain and cramping, unintentional weight loss, unintentional weight gain, feeling full after eating very little, bloating, heart burn, loss of appetite, anemia, and reflux. It affects our quality of life so much that we are unable to do the things we used to love and we lose friends because some friends don't understand. I hate being told this is all in my head when I know it's not. I miss hanging out with my friends. It feels like I'm stuck in my house on house arrest. Imagine having the stomach flu 24/7 and it never goes away! Imagine having to starve because you physically can not eat. Everything you eat comes back up and then it feels like you have strep throat because the stomach acid has burnt your throat from vomiting too much. Also, having severe cramps after you eat and constant muscles spasms almost condition you not to eat. Imagine being tired all of the time and dehydrated because you can't keep anything down and making monthly hospital visits for fluids and medications. FIVE MILLION Americans are suffering and chances are you have never heard of this disease. We want to give Gastroparesis a name, a face, and a loud voice! This disease needs to be well known, well heard, and well understood. There is no cure for Gastroparesis and with out raising awareness and funding, there never will be. So we need your help. We need the government to focus on a research for a cure for Gastroparesis. The one we had before failed. Let's see this one succeed! Spread it around like crazy because no one should starve to death. This petition I've created will bring some awareness to the disease. I'm not necessarily trying to get the government to fix it, but I would like them to be aware of this since it's an, "invisible illness." That's the tough part because people look at you and assume you're fine. They don't see the zip lock bags you keep in your purse in case you vomit in public or a bucket in the car. You can view and sign the petition HERE. It only takes a few minutes and I could use the help. Pass this around to your friends, even my blog if you have to, just to show them how horrible this disease it and what little the doctors can do as of right this moment. I know it's not cancer but people still DIE from this disease. That's why I'm terrified to go to the Mayo Clinic. I'm scared of all of the TREATMENT OPTIONS. Join our cause on Facebook by liking the Gastroparesis Community Page in the link below and send it to others. 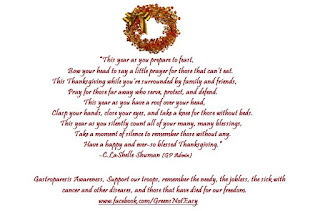 Feel free to share my blog with everyone because no one deserves to starve to death. We shouldn't be unnoticed, written off, or passed over by the medical community because of the limitations of research and medication. My doctor here really doesn't know how to treat me except with pain and nausea medicine, and the medicine only works when it stays down ... which is one of my problems. If you are on Facebook, I recommend the Gastroparesis support group listed above. They have people who care and who understand what you're going through. I feel so at home there and I know I can ask questions without feeling embarrassed. The people there also have the most wonderful advice. It got me through to day because my vomiting is so severe, even food smells make me sick. It's nice to have a group of people who will listen and share their experiences with you. I live in the South where food is a big part of our culture ... but right now, it's my enemy. My stomach is bloated from trying to eat sweet potatoes earlier. I need to make an appointment with the nutritionist but I'm not sure that will help because I vomit up everything. Something has to change soon. I miss my life. I miss my friends, my brothers, my family, and date nights with my husband. I just feel so lost sometimes and I feel like I want to give up. But, I'm determined to fight until someone does research on this disease. There has to be some way to repair the nerve damage to make the my stomach muscles work again. Thank you all for sending positive thoughts my way. I need them. I feel so awful complaining all of the time when I know people have this worse than I do. Thank you for taking the time to read my blog and to take this journey with me. It does mean a lot that I have so many caring people in my life. I just don't know what to do about school. I'm scared to register because I'm not sure what the Mayo Clinic is going to advise yet. It may be more surgery. Share this blog entry and let's all coordinate a date to wear green. 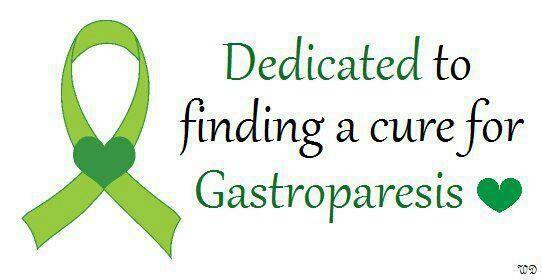 Does anyone know where I can buy a green ribbon for Gastroparesis? FACES OF GASTROPARESIS VIDEO. Be sure to look for me and my online GP friends.